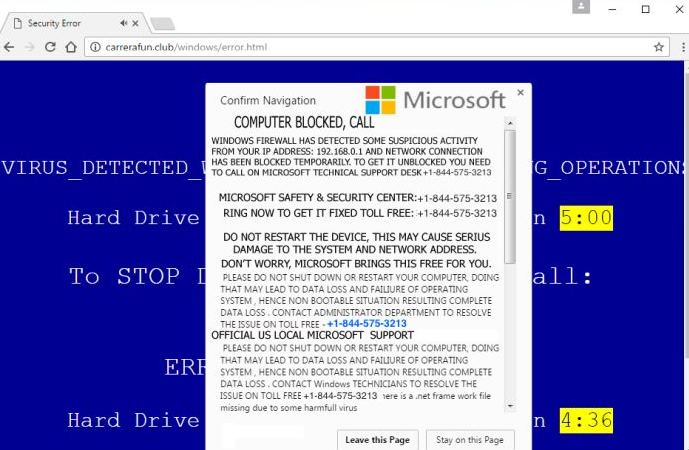 Microsoft Attention Fake Alert Virus is a scam warning, caused by an adware infection. These kinds of pop-up claims to come from Microsoft but it’s only a scam. They warn about some kind of infection and ask that you call a certain number but if you were to do it, you would get tricked. This is your typical tech-support scam and most of us have encountered it at least once in our lives. It is not a serious infection but will be annoying to deal with. Just uninstall Microsoft Attention Fake Alert Virus adware, and everything should return to normal. And try to pay attention to how you are installing free programs because you missed the adware being added to a program you installed. Adware infections are quite common because users are still careless about what they install onto their computers. When you are installing a program, you need to use Advanced or Custom settings, instead of Default. Those settings will show added programs and you will be able to deselect everything. Make sure you uncheck all the boxes, and only then should you proceed to install the freeware. If you want to avoid having to delete Microsoft Attention Fake Alert Virus adware or similar infections over and over again, you need to pay attention to what you install, and how you do it. What does the adware do? Once the adware installs, you will start seeing these warning pop-ups that claim your computer is infected and that your personal information is in jeopardy. These pop-ups might appear on all browsers you have installed, whether it’s Internet Explorer, Google Chrome or Mozilla Firefox. You will only be able stop the ads if you remove Microsoft Attention Fake Alert Virus. The pop-ups will even look legitimate to those less experienced with computers but those who have encountered such warning before will know immediately what it is, a scam. Do no believe what it says because your browser has no way of knowing the things it’s warning you about. Your Facebook and email logins, as well as your credit card details are safe. And your computer is not infected with any kind of malware. Unless, it’s an infection completely unrelated to this. You are provided with a phone number that would connect you to tech-support scammers. They would try to convince you to buy some kind of expensive software or try to plant additional infections via remote access to your computer. You don’t need to call anyone. You just need to uninstall Microsoft Attention Fake Alert Virus adware. If you have anti-spyware software, you can use that to delete Microsoft Attention Fake Alert Virus. This is an easier way because if you choose manual Microsoft Attention Fake Alert Virus removal, you will have to find the adware yourself. Make sure you remove Microsoft Attention Fake Alert Virus fully and it is not able to recover itself.